This is a typical fisherman's house (90 m2) in very quiet area, close to the sea, close to shops, the pier and beaches. Ideal for 5 people. It is located in the typical district of La Chaume near the Wild Coast, the corniche, large beaches. The forest of Olonne sur Mer and the nearby marshes invite you to great bike rides. 2 bicycles including 1 equipped with a child seat are at your disposal to discover these beautiful landscapes. Here, the car is not essential, many bike paths allow you to circulate safely with your children. Shops are nearby (within walking distance). Les Sables d'Olonne offers many activities and activities. 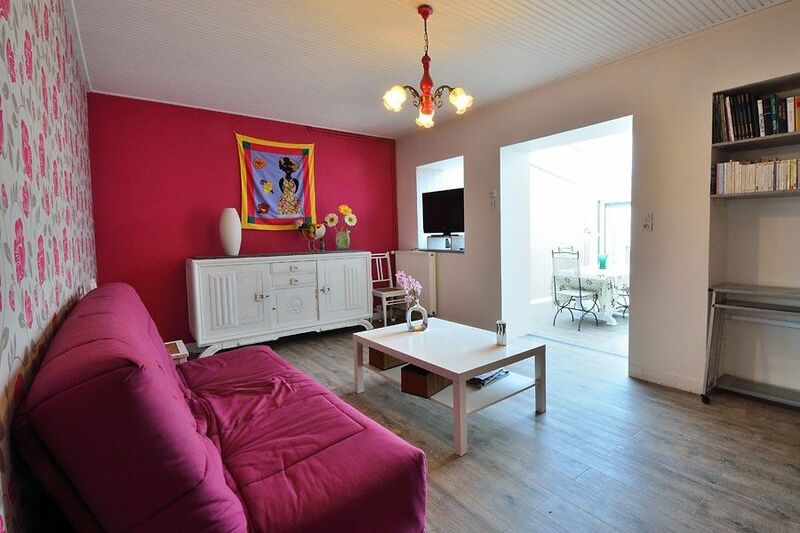 The house has been tastefully renovated and is very well equipped. It has all the comforts: wifi, TV, DVD player, washing machine, dishwasher, microwave, electric kettle, coffee maker, toaster, quality dishes ...). Here, young children are kings and everything is provided for their safety and well-being: fully enclosed terrace, baby equipment with 1 cot with new mattresses, newborn deckchair, play mats, bath, high chair, stroller, books). To enjoy the beautiful wooden terrace, nothing like a plancha to share good moments with family or friends out of sight (not overlooked). A large garden table with colored chairs allow you to fully enjoy the outdoors. Idleness assured. The house has two bedrooms: a bedroom with a double bed (new bedding and quality) and a bedroom with a bunk bed + a single bed both equipped with closet. A lounge with TV and DVD invites you to idleness. The decoration is neat. The living room is extended by the dining-veranda opening directly onto the terrace. Its bay window slides entirely and you have a superb visibility on the terrace with its beautiful camellia. The electric shutter on the roof of the veranda allows to modulate the sunshine in the summer, which makes this room extremely pleasant the summer. The contemporary bathroom in tonic colors has a shower of beautiful dimensions. In summer, we offer an additional bathroom and a toilet on the terrace for your beach returns. Storeroom at the end of the yard to store your bikes and an outside access to go out with your bikes. No pets allowed. No smoking. Bedding for up to 4 adults. Tourist tax to be paid on the spot (1. 10 € / adult / night). Tout y est parfait: le logement, la situation dans le quartier de la Chaume ainsi que l'accueil de la propriétaire. merci Olivier et j espère a une prochaine fois. cette maison est la votre. Parfaite maison de vacances, très bien équipée. Située dans un quartier très calme et proche de tout. Le lieu nous a séduit. maison suffisamment grande pour une famille de quatre sans être les uns sur les autres.Nous reviendrons avec plaisir. Wir haben den Aufenthalt sehr genossen, im Haus ist alles vorhanden, was man für einen Urlaub braucht. Kurze Wege zum Bäcker, Hafen oder zum Strand. Perfekt til familier med små børn! Vi havde et dejligt ophold i boligen, som opfyldte alle vores behov. Værten var enormt sød og imødekommende. Boligen var perfekt til vores to unger på hhv. 4 mdr. og 2 år.